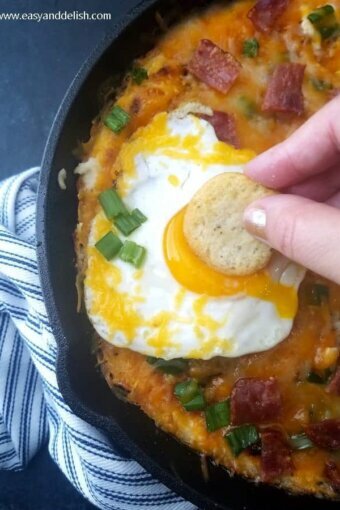 Loaded Mashed Potato Skillet features bacon, cheddar, mashed potatoes, and over-easy eggs if desired. It can be served three ways: as a breakfast casserole, a dip, or a side dish for everyday or for special holidays and sports games. Either wash and cook peeled potatoes in a pot filled with cold water for about 15 minutes or until potatoes are soft or, alternatively, use potato mix (which shaves off 2/3 of the time required). If using potatoes, after they are fully cooked, drain and mash well while they are still hot/warm. If using potato mix (2 cups), follow instructions on the package, adding boiling water, salt, butter, and milk in the amounts stated on the package. Mix either mashed potatoes or cooked potato mixture with cream cheese, sour cream, seasonings to taste, garlic powder, 1 cup cheddar, 3 slices of cooked chopped bacon, and most of chopped green onions. Stir well until obtaining a homogeneous mixture. Spoon into a well greased 8- to 9-inch cast iron skillet. Bake on the middle rack for about 20 minutes. NOTE: If serving for breakfast, make 4 to 8 wells on top of the potato mixture and break one egg into each well before baking. Remove from the oven and preheat broiler. Meanwhile, top baked potato mixture with remaining 1/3 cup cheddar cheese and 1 slice chopped cooked bacon. Broil on top rack of the oven (about 5 inches away from broiler/heat) for 1-2 minutes or until cheese is melted. Serve immediately, accompanied by toast, bruschetta, mini sweet peppers or jalapeno halves, or as a side for meats. Enjoy! Loaded Mashed Potatoes are cooked and mashed potatoes mixed with cheese and bacon. This easy Loaded Mashed Potato Skillet can be served 3 ways: as a breakfast casserole with over-easy eggs, as a dip accompanied by bruschetta or mini sweet peppers/jalapeno halves, or as a side dish for meats. It is great as an everyday dish or for holidays and sports viewing parties. Because eggs are optional in this recipe, they are not calculated in the nutritional info. Small eggs have about 50-60 calories each and large eggs, 70-80 calories each. Love mashed potato dishes? Try our Mashed Sweet Potatoes w/ Coconut Milk, Bacon & Cilantro.